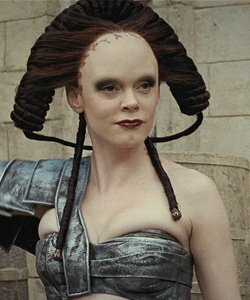 Rose McGowan as Marique in "Conan The Barbarian"
The 37-year-old actress was asked by producers to remove her brows and shave back her hairline to play evil sorceress Marique in the new movie but she insisted she wouldn't do it unless the price was right. She said: "The studio asked if I would shave my eyebrows and my hairline back to here, and I thought, 'Sure, if you give me $5 million.' "
However, the studio turned down her request, forcing the actress to spend hours at a time in the make-up chair getting ready for the role, which included slicking back her hair and wearing a prosthetic piece that went over her highbrows and back to the middle of her head. She told Access Hollywood: "I sat from about two in the morning till around 7.30 in the morning." Rose – who was in a car crash in 2007 - has also revealed she is having to turn down roles because of an arm injury which could be left irreparably damaged if she hurts the limb again. She said: “I had a really severe injury which left me basically paralyzed in the right arm.